One of the many reasons I enjoy hanging out with older people is I get to benefit from their experiences and wisdom without having to experience the actual physical injuries and restraining orders firsthand. 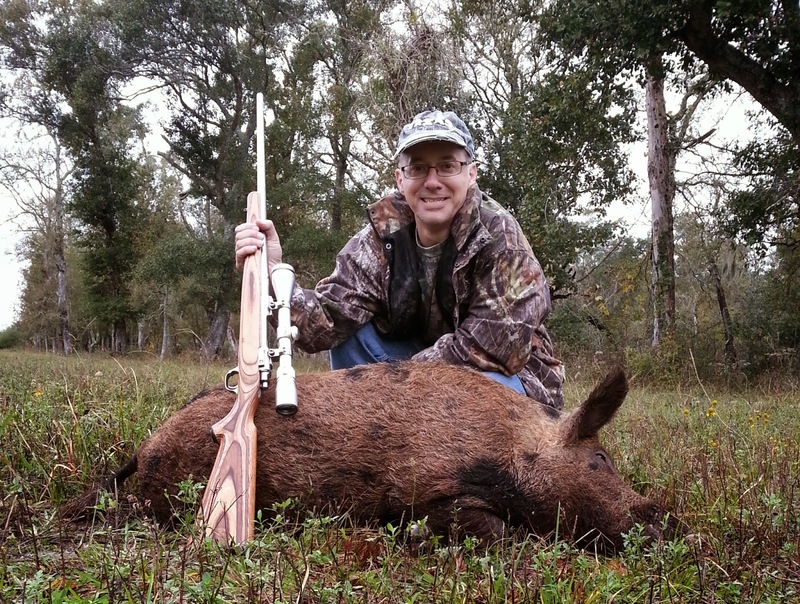 Our hunting lease is a perfect example where this sort of osmotic learning can take place. I just need to remember to shut my mouth long enough to learn from the available wisdom. There is an older gentleman (a term I use loosely) I've known for ~10 years. He had a hip replaced a year ago but is now in the market for two new knees. For this discussion, let's simply refer to him as "Mon Dartin" (not his real name). Being semi-decrepit yet wiser than he looks, Mon is chock full of labor and back saving tricks that have turned out to be exceedingly useful in the woods. This post outlines the first of the 2 methods I've learned from him on how to load things heavier than you can comfortably lift. Mon looked at me like with his "this guy must be an idiot" look and proceeded to share the following loading technique. Recently, I had the opportunity to use it and thought I'd share. 2. Immediately gut it to lighten the load by ~30% and help the meat cool down more quickly. 3. Drag the boar to a conveniently shaped tree to (i) remove the accumulated fire ants and (ii) allow you to hoist it up. 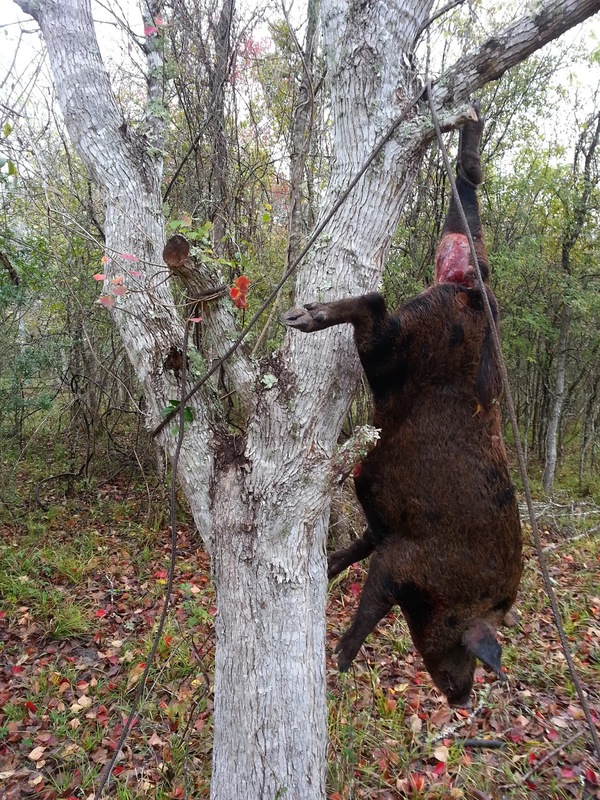 A bad tree will have a weak or dead branch at the ideal 10' height that will result in unplanned hog-to-ground (HTG) contact. The details of how I know of the HTG phenomenon are unimportant at this time. 4. Take a long section (~50') of strong rope and double it back on itself in the middle. Throw this loop over the target branch in the tree. 4.5 Repeat Step 4 multiple times until the rope is, in fact, OVER the target branch. Swearing may help. 6. 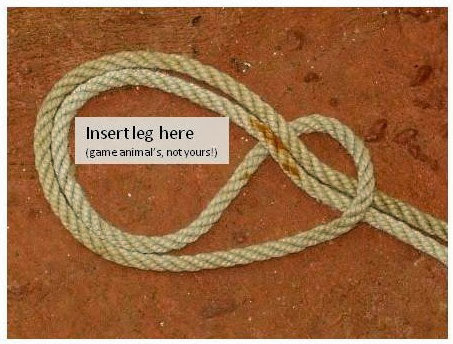 Put one of the animals back feet/legs through this loop as shown. 7. 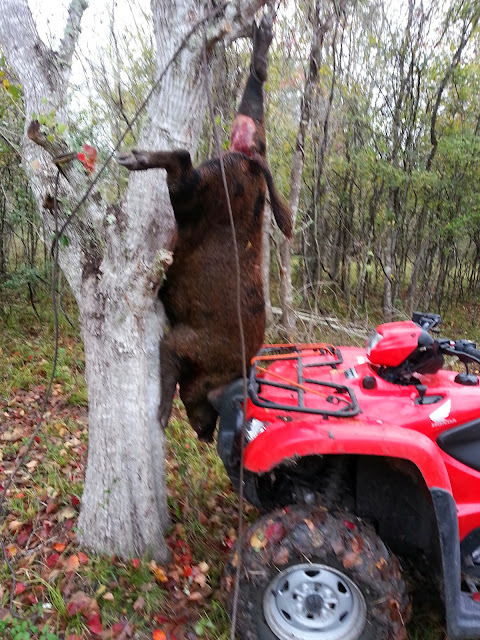 Tie one end of the rope to the 4 wheeler and gently pull the hog skyward until it will generally clear the 4 wheeler's rack. 8. Set the parking brake and WHILE NOT GETTING UNDERNEATH THE ANIMAL, wrap and tie off the other rope end (the loose one) to a tree trunk or stout branch. 9. 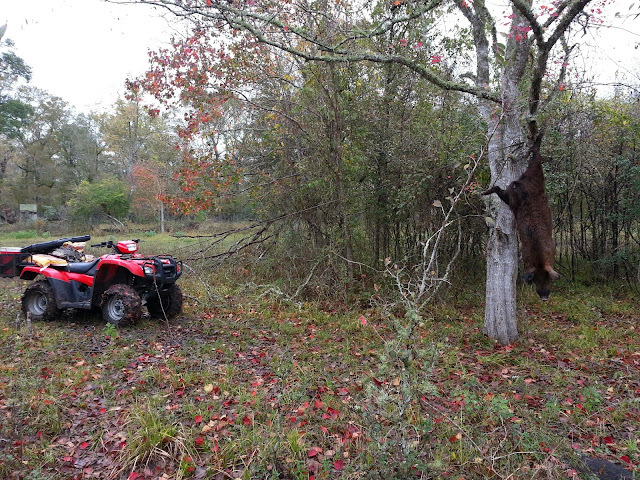 Slowly ease off tension on the 4 wheeler rope to ensure the tie-off rope is holding. 10. 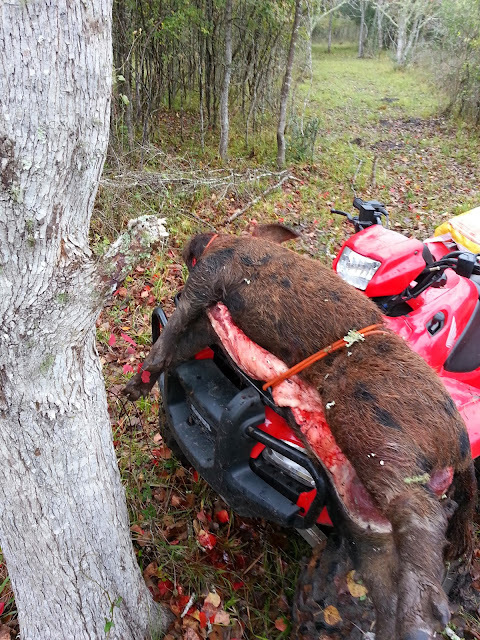 Position the 4 wheeler under the hog and slowly lower it down by letting out a small amount of rope and using the tree trunk or branch as a brake. 11. Secure hog to 4 wheeler rack with bungee cords, rope or the weight of a small child and drive back to camp, basking in your labor-saving glory. 12. IMMEDIATELY scrap off any stray fire ants that fly off the hog onto your person while you proceed down the trail. Method #3 (future post) is a bit more challenging but is useful when there are no trees around!